Traveler WordPress theme is a beautiful and modern theme, designed specifically for travel bloggers. The elegant, grid-based layout puts the focus on your featured images. The different post types allow you to choose the best way to display your photos and articles. 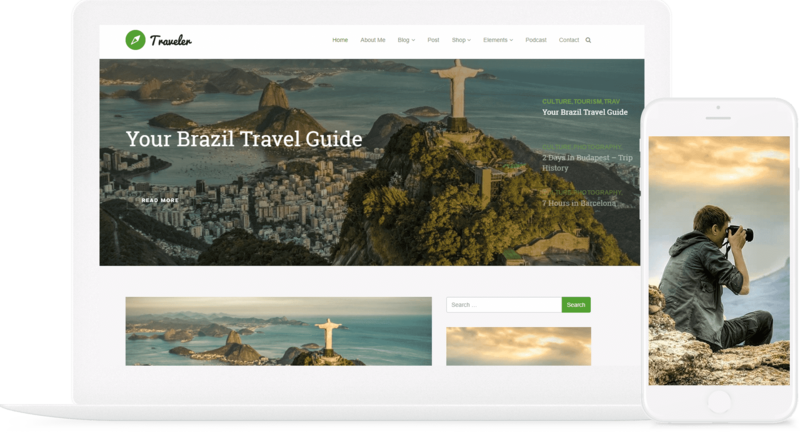 Whether you need pages with advanced resources, headers, menus, striking galleries, a professional blog, posts, stunning share system or an online store, it’s all included on our Traveler WordPress theme. Best of all, everything is mobile-ready right from the start. The next level of blog builder tools is here. Drag&Drop any blocks you like with Traveler, then upload media and text and publish your new site. It’s really easy and fast flow! To be even more unique, we have prepared for you a beautiful set of elements that you can use in your projects of any complexity in an easy way. Traveler WordPress theme is the best Drag & Drop blog builder template. Traveler WordPress theme gives you complete freedom over your creative process after all you don’t have to think about any technical aspects. There are no limits and absolutely no coding. You can create any kind of web publications using only one tool. Traveler WordPress theme has tools and options that will save your time for you to focus on more important, your legacy. If you like to write posts, you probably have thought about making a stunning blog site for it. Traveler WordPress theme is built on a blazing-fast managed framework, optimized to the exacting standards of professional WordPress designers and developers. Your website will adjust to any screen resolution of the device it is being displayed at, without hiding unnecessary elements. Traveler WordPress Theme is mobile-friendly. There is no need to manually test anything in different browser versions and platforms. Traveler is perfect in all browsers. Use Traveler WordPress Theme Options to get your site up and running in minutes and start customising your new site with just a few clicks of the mouse in an intuitive pinel. Visualmodo, while presented elegantly, is an incredibly rich publishing platform. Here, you can find a full list of everything the Traveler WordPress theme platform can do. It expands the mind and inspires us to be worldly people, and what better way to document your travel life and fondest memories than with this stunning modern WordPress design. Of course, stunning photography is your niche, and you want to keep it all organized. Traveler has you covered with simple and elegant Photo Grids. Use columns for beautiful collage effects or go full width, the choice is yours. A clean, modern, minimalist, blog WordPress theme. It has a wide range of incredible features and includes $150 worth of goodies, everything you need to create an awesome site in an incredibly easy way of saving money and time doing it. Build any site design without code knowledge! Related Posts – Quickly increase your readers’ engagement with your posts by adding Related Posts in the footer of your content. Automatically added Related Posts can increase your internal traffic by up to 10%. Cross Browser Compatibility – No browser is left behind with the Traveler WordPress Theme! All modern browsers supported by Rare include Google Chrome, Firefox, IE, Opera and Safari. Slider Revolution – Traveler not only supports but includes the premium Slider Revolution plugin (a $26 value) for free along with your purchase of the theme. Easily create and manage unique slideshows with captivating transitions and animations that are all completely responsive. With Traveler, you can easily include a slider in any page with the best slider plugin. Contact Form 7 – Traveler theme supports the best contact form plugin and also display it elegantly and have elements to easily apply it form on a page. A Real Theme for your online store/shop! Traveler is ready as an eCommerce platform, having built-in styles for WooCommerce plugin, which at this moment empowered ~30% of the world online stores!! but we take it to the next level!! Currently, inside Traveler, we added 3 different store landing pages and refreshed the overall feel and layout, but we’re planning to continuously release new niched demos and entirely new styles – Periodically try dropping a visit, you’re more than welcome! Traveler also has its own advanced custom style for your cart/account and check out WooCommerce pages to make your store look amazing and user-friendly for your customers! Make sure all your shop clients will love to purchase your products/services once your shop is powered by our theme store framework. Clean Code – Traveler conforms to industry best practices at all levels. The attention to detail given by our developers on all levels is absolutely unparalleled. Implementing the latest HTML5 and CSS3 techniques, we not only develop the theme but work with it on our personal websites and projects every day. Custom Post Types – With Traveler WordPress Theme you have some great posts types to better show your content with our Portfolio, Team Member, Knowledge Base and gives you the freedom to build your own post type in the way you like. Updates – Our first priority is to keep Traveler theme on the top and working perfectly, and our team is quick to address bug fixes as well as adding new features to the theme. You can update the theme using our auto-updater 1-click system. Search Engine Optimized – An important topic or any site is the search engine optimization. We actually have data to back it up. Traveler was built to help your site rank. Rest assured that everything from the functional markup utilizing the latest semantic HTML5 elements, working together with the best WordPress SEO plugin compatibility. Timetable Responsive Schedule For WordPress – Is a powerful and easy-to-use schedule plugin for WordPress. It will help you to create a timetable view of your events in minutes. Perfect for gym classes, school or kindergarten classes, medical departments, nightclubs, lesson plans, meal plans etc. It comes with Events Manager, Event Occurrences Shortcode, Timetable Shortcode Generator and Upcoming Events Widget. In conclusion, you gain this plugin ($26 value) for free purchasing the Traveler WordPress theme. Visual Menu (mega menu)– In the case that you want to display more content the Visualmodo menu offer a visually engaging way to organize complex navigation layouts and build any menu style in an elegant and easy way. Tags: travel, traveler, blog, posts grid, blogging, blogger, trip, voyage, masonry, writer, trip advisor, business WordPress, agency, agency WordPress, business, business consulting, business agency, travel group, APP, creative, one page, resume, SEO, travel agency, SEO business, SEO agency, CV, application, landing page, startup, personal blog, shop, WooCommerce, modern, store classic, article, marketing, RTL, presentation, minimal agency, resume box, portfolio, CV web design, design, tour, artistic portfolio, excursion, junket, cruise, spin.